Pope Francis will spend his first full day in the United States Wednesday meeting with President Barack Obama at the White House and canonizing an 18th century Spanish missionary who spread the word of the Church in what is now California. “Our goal here has been to ensure that the way the pope is received here in the United States is consistent with the warm feelings of admiration and respect that the American people have for the pope, his teachings, his values and the way he has lived in life,” said White House Press Secretary Josh Earnest. Amid cheers of “welcome to the U.S.A.,” the pope disembarked from the plane, shaking hands with the first and second families, local archbishops and Catholic students, as he began his historic trip to the United States. After the greeting from Obama and hundreds of cheering well-wishers, Francis was taken by motorcade to the Vatican's diplomatic mission, the Apostolic Nunciature, where he will stay during his visit to the nation's capital. Instead of a luxury limousine, the 78-year-old pope rode in a simple black Fiat sedan, waving to the large enthusiastic crowds that lined the route to the mission. President Obama last met with the pontiff at the Vatican in March of 2014 - but it is the first time the pontiff has set foot on American soil. National Security Council’s Charles Kupchan said White House officials traveled to the Vatican in June to shape the agenda of the pope’s U.S. trip. 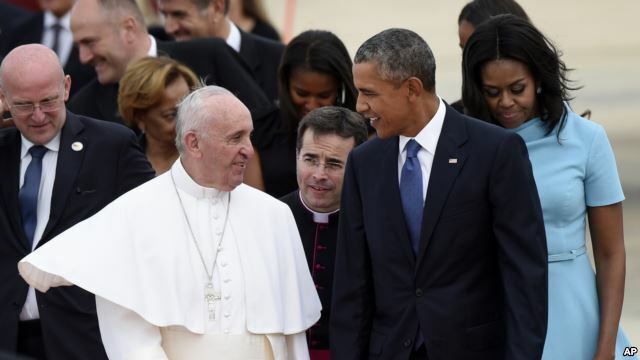 On Wednesday, President Obama will welcome Pope Francis to the White House with an official arrival ceremony on the south lawn and an estimated 15,000 people in attendance. After Obama and the pope make brief remarks, the leaders will head into the Oval Office for one-on-one talks that administration officials say will be centered not on advancing a political agenda, but on committing to shared values. “The way that both of these men have dedicated their lives to advancing values related to social justice and prioritizing those who are less fortunate and that they pursue those values with a sense of conviction, I think, gives them a lot of things to talk about,” Press Secretary Earnest told reporters Tuesday. In addition to combating social and economic inequality, White House officials point to other areas of common ground including the fight against climate change – the focus of Pope Francis’ encyclical that came just months before a United Nations climate conference in Paris in December. “I think the pope has spoken about the need for all of us to meet our responsibility to care for God’s creation. And that I think provides an important moral backdrop to the type of policy decisions that individual leaders will make on climate change,” Deputy National Security Advisor Ben Rhodes said in a recent press call. Pope Francis has also spoken out against the persecution of religious minorities – particularly in the Middle East, where Islamic State militants have targeted Christians and Yazidis in deadly attacks. This commitment to religious liberty and the rights of religious minorities is another shared value, White House officials say. Other possible topics of discussion – immigration, the Iran nuclear agreement and the normalization of ties between the United States and Cuba – an area where administration officials say the pope’s leadership in promoting engagement was critical. The pope arrived in the United States Tuesday after a historic visit to Cuba and the Vatican hosted U.S. and Cuban delegations last December as both sides finalized an agreement. After his meeting with Obama Wednesday, Francis will take part in a parade around the National Mall, hold a prayer meeting with U.S. bishops, and celebrate a Mass canonizing Junipero Serra, the Franciscan friar who founded Catholic missions along the coast of California while marching with Spanish conquistadors. Serra's elevation to sainthood is a sore point for many Native Americans, who say Serra contributed to the abuse and elimination of many indigenous tribes from enslavement and disease. On Wednesday, Francis becomes the first-ever pope to deliver an address before a joint meeting of Congress. He will travel to New York City Friday to address the United Nations General Assembly. On Saturday morning, he'll travel to Philadelphia for this weekend’s Vatican-sponsored World Meeting of Families. As Pope Francis’ airplane approached, President Barack Obama, First Lady Michelle Obama and their family were on hand at Andrews Air Force Base outside Washington to welcome the head of the Roman Catholic Church to the United States. A crowd of 1,000 selected ticket holders gave the pontiff an enthusiastic welcome. Earlier Tuesday, hundreds of low-wage workers at the U.S. Capitol walked off their jobs and rallied at a nearby Catholic church. They said they may be invisible to the powerful lawmakers they serve every day, but they know they deserve a better life. Democratic presidential candidate Bernie Sanders was at the church to support them. “Today as we welcome Pope Francis to the United States and the U.S. Capitol, I hope that every member of Congress and the president will heed his call for social and economic justice,” said Sanders. One of the service workers is struggling, even though he has a job in the Senate cafeteria. "Homeless and sleeping on the street, you know, every day you know, I was literally on the streets because I wasn’t making any money. I didn’t have a livable wage, you know and like I said, the few dollars I did make in order for me to keep my hygiene up because I work in food service," said Charles Gladden, a Senate cafeteria worker. Gladden said this pope gives him new hope. "I’m saying he’s more adamant about speaking about the low-income people, speaking about social injustice – he speaks about the necessary things that touch the little man,” said Gladden. Sontia Bailey, one of Gladden’s colleagues, said she works two jobs – 70 hours a week – and that tough schedule likely caused her to lose her son at his birth. She hopes lawmakers listen to the pope’s message. “Hopefully they find deep down inside that we have got to pay our workers living wages – nobody should have to suffer or go through what I’ve been through,” said Bailey. Inside the Capitol, Republican Senator John Thune said Pope Francis may have some different opinions on economics. “We hope there are some things he can take away from visiting our country for the first time: recognizing that free enterprise is the greatest antipoverty force that the world has ever seen,” said Thune. There is no word on whether Pope Francis will directly respond to the Capitol workers’ letter, but he is expected to address the issue of income inequality when he speaks to Congress Thursday. World leaders are about to converge on the United Nations in their largest numbers yet. More than 150 presidents and prime ministers will attend this year’s General Assembly which also marks the U.N.’s 70th anniversary. There will be no shortage of crises for the leaders to discuss. Pope Francis arrived at the U.N. on September 25th, just hours ahead of the opening of a major anti-poverty summit. “We have been discussing many issues, including poverty eradication and migration, refugee issues, last time, and most importantly, climate change,” said Ban. The Pope will then give a highly anticipated address in the General Assembly Hall. “Remarkably, he seems to have emerged as a real voice of global moral authority on things like refugees and climate change. A lot of people will be looking to him and what he has to say about the state of the world,” said Carne Ross, a diplomatic consultant. Then it’s down to business with the world’s toughest problems. On September 30th, there will be a high-level meeting on the refugee crisis in Europe. The secretary-general says he hopes to mobilize a humane and effective response. The majority of refugees are Syrians, fleeing nearly five years of civil war. Russia’s recent increase in military support to Syrian President Bashar al-Assad has raised tensions with Washington. President Vladimir Putin, who has not attended a General Assembly in nearly a decade, may bring a new strategy on Syria, but it may not be to everyone’s liking. “There is a fundamental division with the U.S. and Europeans over Assad, and Moscow’s continuing support for Assad, so it’s likely to be a diplomatic breakdown rather than a breakthrough,” said Gowan. President Obama will preside over a meeting on combatting terrorism. “The President is going to convene a meeting to look at countering violent extremism, to look at what the coalition has achieved and where the gaps are,” said Samantha Power, the U.S. Ambassador to the U.N. This year’s General Assembly may be the biggest ever, both in terms of leaders and challenges.